160 full-color photographs and 1 map, 208 pages, 9 3/4 x 11"
Part of the photographer's challenge lies in capturing a familiar scene in a startling and original way, and Michel Setboun has succeeded in his beautiful work, Bell Towers of Paris. The acclaimed photojournalist spent five years climbing the steps of the French capital's famed bell towers (most of them inaccessible to the public), cutting a bird's-eye-view trail through the city that he records lovingly in the pages of this spectacular book. From Notre Dame to Invalides, Sacré-Coeur to Hôtel de Ville, here are 160 breathtaking views of the City of Light as even its long-term residents have never experienced it--adrift and timeless. 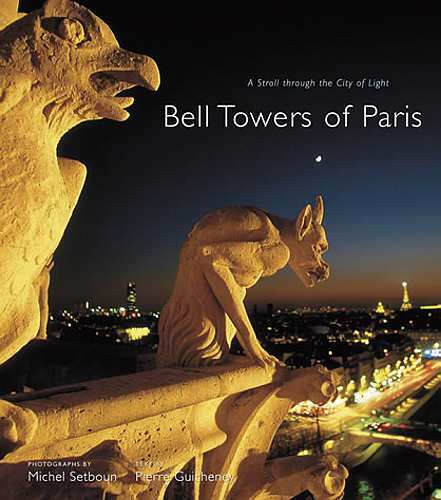 With a helpful map, and informative historical text by French journalist Pierre Guicheney, Bell Towers of Paris provides a whole new way of seeing one of the world's most beguiling cities. Michel Setboun began his career as a photographer in 1978. His work has appeared in numerous international publications, including The New York Times, Géo, Life, Paris Match, and Le Figaro. He lives in Paris. Pierre Guicheney is a reporter for Géo magazine. He is the author of several books and a producer of documentaries, and lives in Paris.